As promised, I'm posting my final page that I created for TMNT (Teenage Mutant Ninja Turtles...As if you didn't know) vs Zombies. If you're curious, it took me a total of about 30 hours to complete, from thumbnails, rough layout, pencils, digital paint, and lettering. All work besides traditional pencils was completed in Photoshop CS4. Teenage Mutant Ninja Turtles are Copyrighted to Mirage Studios and their respective owners. when will there be more?! Sadly not any time soon Maybe one day but it's unlikely that I'll have spare time to try and make more. TMNT and zombies. two of the best things in the whole entire world. I love it when people put the two of them together. It makes my life soooo much better!! this is awesome! i want more turtles!!! why has no one thought of this before!!?? Fantastic idea! Fantastic art! Thanks! I thought I was the first one to come up with this idea but sadely other people already beat me to the concept. Oh well It was still major fun and I hope to do more in the future! Well, this is the first time I've seen such a concept, though I have seen some do zombie TMNT, Like the Marvel Zombies. awesome!!!! zombies and ninja turtles!!!!! trucking right!!! Thanks! Yeah if I ever finish the comic it will definitely be intense! I have only one thing to say...AWESOME!!! Lol Glad you like it! Beyond the fact that this is a gorgeously styled page... May I say I ADORE the look of Leo's pastron's edges? That is a detail I immediately fell in love with. Your zombie faces are EPIC. It looks like it! If it was only half as fun to draw as it is to view, that woulda been a killer 30hrs!! No sadly there isn't I'd like to make a whole comic one day but we'll see...so just this first page for now. Well, you've got a helluva start for a great comic! Sometimes the beginning is the hardest step. Even if this is all we ever see, may I say again, WOW! 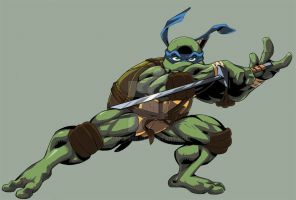 I like the muscly style for the Turtles here much better than the new-age anime look. It works very well with the concept, too. Great work! I can't wait for the next page. Heh, pretty cool idea and nice execution on it. You do any other comic-type work? Not really. I do more digital paintings though I'd like to work on more penciled comic book work. Most likely though it's just gonna be comic characters that are digitally painted though Hopefully one day I'll be able to finish this TMNT comic, it was a lot of fun to do even this one page! Sometimes painting is the way to go, depending on the story. Alex Ross proved that!